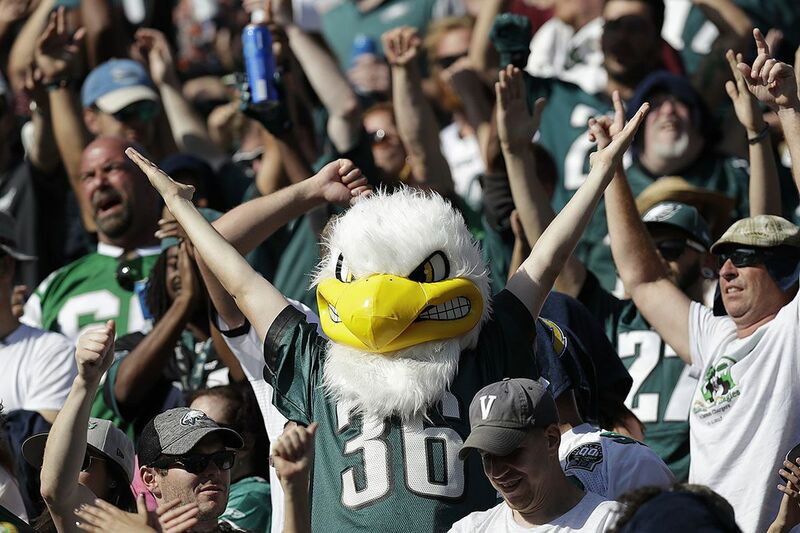 A happy Eagles fan cheerS after the team scored a touchdown against the Chargers last season. Single-game tickets for Eagles games went on sale Thursday morning, but many fans trying to purchase tickets came away with nothing but frustration. The Eagles made tickets available for their two preseason home games and eight regular-season home games at 10 a.m. on Ticketmaster. But due overwhelming demand from fans following the team's historic Super Bowl run, most games were quickly sold-out at face-value prices, and all that remained were higher-priced seats through Ticketmaster's verified resale website. According to an Eagles spokesman, the team's box office didn't receive any complaints from fans unable to purchase tickets. The bulk of the complaints were directed at Ticketmaster itself, which didn't respond to a request for comment. The spokesman confirmed there were no site crashes or technical issues like those that greeted fans who attempted to purchase tickets to the Eagles' London game against the Jacksonville Jaguars on Ticketmaster's UK website earlier this month. And some fans posted on social media websites like Reddit and Twitter they were able to secure tickets in the 200 level at face value. But a large number of fans vented their outrage at Ticketmaster after facing slow load times, spinning wheels and frozen webpages, which they said prevented them from securing tickets at face value. Deanna Garcia, an Eagles fan who lives in Westampton, N.J., has gone to at least one game a season with her brother since 2009. But last year, Garcia was unable to get through on Ticketmaster from work, so she took vacation time and had her phone, desktop and her daughter's iPad ready to go. "At 10 a.m. on the dot I submitted my request for two tickets. Without hesitation, it took me to tickets for sale, however, the cheapest available was $295 for one upper-level seat," Garcia said. Face-value tickets were made available to Deanna Garcia, but Ticketmaster’s website wouldn’t allow her to complete the purchase. At 10:07 a.m., Garcia saw a screen where two tickets to the Eagles' home opener against the Atlanta Falcons were available for $85 each. She immediately selected "get tickets" and was greeted with a loading wheel that continued to spin for nearly 40 minutes. At 10:42 a.m., Garcia said, the wheel stopped and she was redirected to a blank screen with no tickets in her cart. "I am so disappointed. I would've rather waited in line in person and been given a fair shot," she said. Chris Lawrence's experience was similar to Garcia's. Lawrence, a life-long Eagles fan who lives in Northeast Philadelphia, also sought to get tickets to the opener. But Ticketmaster displayed only resale tickets that were going for about $300 per ticket. Lawrence tried to purchase standing-room only tickets, but after an hour of being told he was in line, he also ended up with a blank screen and no tickets. "I get it… I know that the tickets reserved for the general public on sale are extremely limited," Lawrence said. "It's just a bummer… not being able to see the banner the first night." Of course, there are plenty of tickets available on resale websites, including Ticketmaster's, which had opening-game tickets in the 200 section for about $250 each Thursday afternoon. At StubHub, the least-expensive ticket for the Falcons game was going for $194, while the cheapest seats available on Viagogo were selling for $270. If you wanted to get into the 100 section, the cheapest tickets available through Ticketmaster's verified resale site were $555 a piece. Justin Bains, an Eagles fan from Vancouver, Canada, was able to purchase tickets to the Eagles-Texans game on Dec. 23 and plans to bring his father. But when he realized he wouldn't be able to travel to the game, he decided to sell the tickets to another fan directly on Twitter, rather than dealing with Ticketmaster again. "Ticketmaster is a joke. They wanted another $9 per ticket just to sell them after around $20 per ticket in service fees to buy them," Bains said. "I just couldn't bare to see Ticketmaster make anymore money off Eagles fans."